There is little disagreement among lawmakers, frontline workers, government agencies, and even rail carriers themselves that freight rail in this country must be held to the highest safety standards and oversight rules. Yet, as we speak, the Federal Railroad Administration (FRA) is allowing foreign crews, originating in Mexico, to operate in the U.S. without assurances that U.S. safety rules are being followed. To make matters worse, the same carrier operating these trains — Kansas City Southern Railroad (KCSR) — has applied for a waiver from the FRA to conduct safety-sensitive brake tests in Mexico. Such a move would not only punt good, middle-class jobs across the border, but would undermine the safety of freight trains entering the U.S.
Now, a bipartisan group of lawmakers is calling on Secretary of Transportation Elaine Chao to right these wrongs and uphold strong safety standards in this industry. In July, without any hearing or opportunity for public input, the FRA gave KCSR the green light to operate trains in the U.S. with Mexican-domiciled crews. This decision allowed KCSR to be the first and only cross-border rail carrier to operate trains in the U.S. with crews that have originated in Mexico. The concerns here are many. KCSR’s plan deliberately exploits current regulations to avoid complying with strict drug and alcohol testing standards. Current U.S. Department of Transportation regulations allow Mexican-based crews to go 10 miles past the border without being subject to U.S. drug and alcohol testing rules that U.S. workers must follow – a regulation we believe should be modified. Conveniently, KCSR is operating trains with Mexican crews nine miles past the border, but we have reason to believe they may push this limit. In addition to not facing drug tests, there is concern that Mexican-based crews do not have to meet the same training and certification requirements of U.S. crews. When it comes to crews originating in Mexico, KCSR seems intent on imposing less rigorous skills testing for engineers, no certification for conductors, and no standards for English proficiency, which is necessary to communicate with U.S.-based personnel. There are also safety problems with KCSR’s request to conduct brake inspections in Mexico. The Rail Safety Improvement Act (RISA) of 2008 provides clear conditions on brake inspections conducted in Mexico for U.S.-bound trains. Among them: a demonstrated ability that Mexican employees can meet the training and qualification requirements of U.S. employees, inspections by the FRA of Mexican facilities, and cooperation between Mexico and the U.S. to ensure standards are met. We are not close to meeting any of these legal safeguards. In fact, a 2011 request by a different carrier to conduct brake inspections in Mexico was rejected because a bilateral agreement allowing FRA inspectors into Mexico does not exist. What’s more, Mexico’s rail agency, the Agencia Reguladora del Transporte Ferroviario (ARTF), is only two years old, and is still developing its own regulatory framework. The agency’s ability to promulgate and enforce safety standards is entirely unknown. The idea that we should collectively place our faith in this nascent regulatory entity to ensure the safety of trains entering and operating in the U.S. is absurd. Make no mistake: KCSR’s effort is not a one-off. If this outsourcing plan is allowed to proceed, nothing will prevent other U.S. and Mexican carriers from following suit and doing so without any guarantee that U.S. safety rules are being followed. We also know that if KCSR’s waiver to conduct brake inspections in Mexico is granted, the scope of those inspections could easily be expanded to more complex safety-sensitive functions. And we doubt that KCSR and other carriers will be satisfied with operating trains just 10 miles past the border, and will likely seek to take full advantage of the lower labor costs that this one-sided business model can offer. The pursuit of profits cannot and must not run roughshod over safety standards and good jobs. 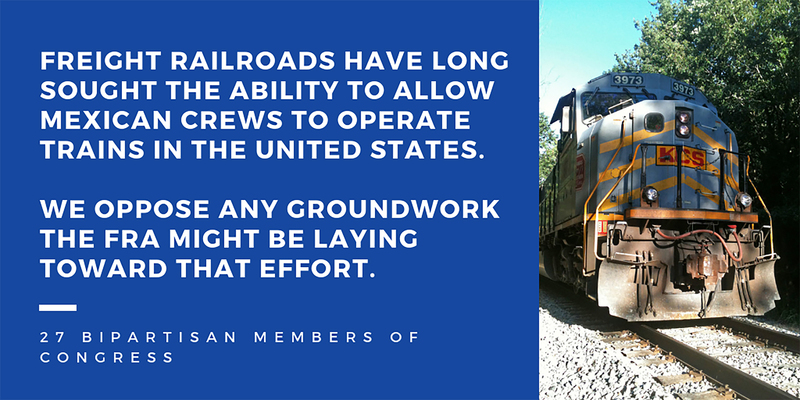 That is why we join lawmakers in calling on the Trump Administration to stop KCSR from continuing its dangerous practice of operating freight trains with Mexican crews in the U.S. It is why we call on the FRA to reject KCSR’s request to allow brake inspections to be done in Mexico. And it is why we call on Congress to provide oversight and be prepared to legislate against the unsafe outsourcing of U.S. rail jobs.